La Sal Pass, in the Snow! Friday morning Misty and I in my CJ, and Tyler in his TJ met up with Paul Renninger and his group of four Jeeps. The early part of the trail went well, and at Hell’s Gate I went up, giving Misty her first experience going up this obstacle, then came Tyler with no problems. I then spotted the rest of their group up the obstacle, and except for a few lifted tires, resulting in a couple nervous drivers, everybody came up wonderfully with no issues. Next stop was Mickey’s Hot Tub, I went through, again taking Misty through for her first time, followed by Tyler. Misty enjoyed it so much that she had me go through a second time just for fun. After watching Tyler comes through, Paul decided to give it a shot since his and Tyler’s Jeeps are very comparably built. He gave it a great shot, but it wasn’t his day to make it; he got close to rolling a couple times, but kept under control enough to keep the Jeep rubber side down. Again after watching Tyler and I go through, Paul decided to give The Escalator a try, and after little bit of struggling he finally made this obstacle. On our way over to Tip-over Challenge I noticed that my Jeep was steering strangely, upon examination we found that my track bar bracket had ripped off the frame which explained the virtually nonresponsive steering. We were able to use a chain and ratchet strap to center the axle, and I limped off the trail slowly, but under my own power. We dropped the CJ off at the Moab 4×4 Outpost, and within a few short hours it was fixed and I picked it up (Thanks again Steve!). Paul decided he wanted to try something a little bit more difficult for Saturday, so Tyler and I took him out to run Strike Ravine then into Area BFE where we ran The Gatekeeper, Minor Threat, and Green Day; the same thing that Misty had driven a couple weeks ago. 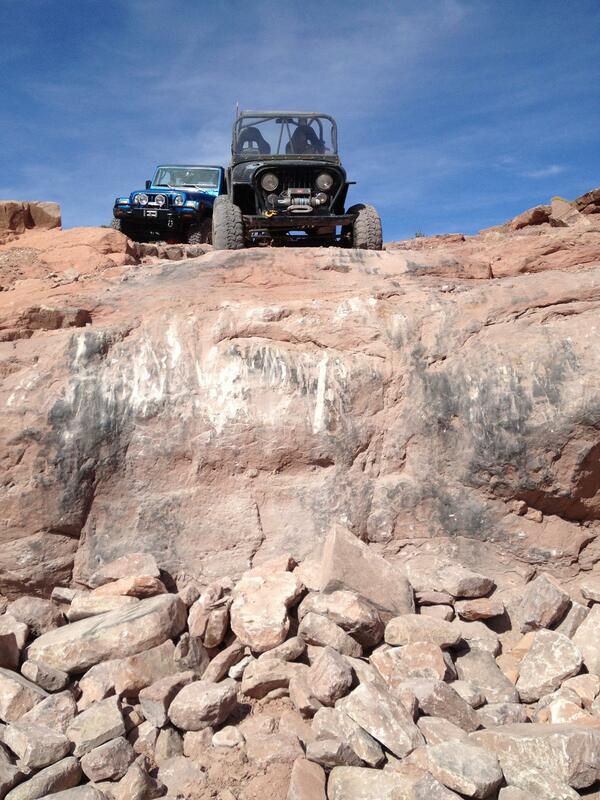 A great time was had by all of us, and Paul definitely got a chance to test his Jeep’s capabilities. Sunday I met up with Ed Weber and his group of friends, including fellow Red Rocker and good friend Jonny Cobia (he’s also the son of Mike Cobia, who has helped me out on the CJ several times). Poison Spider was the chosen trail for the day, which was great for me, because I really enjoy that trail. Everything went smoothly, and we had a great time. Monday I was called to substitute at the high school, but Tuesday I was off and we went back out on the trail again. This time it was Steelbender. 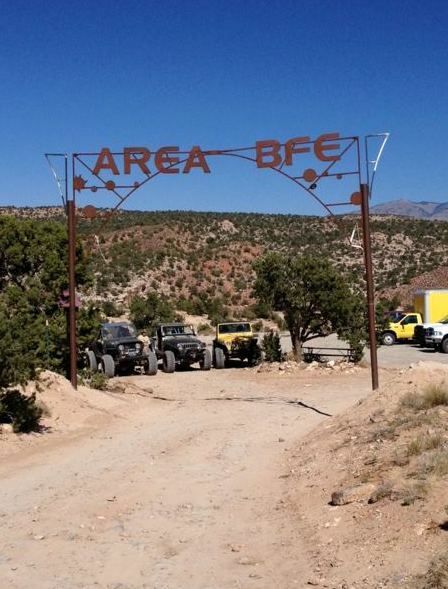 With such a small group, we were able to do the longer northern loop, a route I normally don’t take during Jeep Safari because it adds too much time with a large group. Everything went fine until we got to the obstacle called Dragons Tail. This is a very steep drop-off with no real go around. I went down it, then just for fun I decided to try coming back up it, unfortunately I didn’t make it, I don’t think I was hitting it with enough momentum. No problem there is always another day. Nate in his XJ did finally make it up, not real smooth, but he did make it. After watching everybody else come down the obstacle we got ready to leave, I started the CJ, put it in gear, and I had nothing, no forward motion at all. I didn’t have reverse, or any of my forward gears. The only thing that worked was park and neutral. We messed with things for quite awhile before concluding that most likely my transmission pump had stopped working; without the pump to move the fluid, the transmission can’t work and I was pretty much dead in the water. Luckily the motor ran, so at least I had power steering and power brakes. But from there through the rest of the trail, I had to be strapped out, being pulled by Ed’s Jeep. It was a slow, bumpy process, which even included me having to be winched up two different obstacles, but eventually we made it, getting back to town at about seven o’clock. It was a long day, but I’m very appreciative of the good friends I had with me who dragged me off the trail, and didn’t abandon me. Thanks again guys! So back to the Outpost the CJ went to have the transmission removed, and sent back to Cortez where the repairs will hopefully be covered under warranty, since the transmission only has a few hundred miles on it since it rebuild last fall. Wednesday, while hiking around at Arches National Park, Ed and his friends met a couple from Australia who had never been out Jeeping before. So they invited them to come and do a night run on Hell’s Revenge. With my CJ down, I rode with Nate in his Cherokee, I even took him up Hell’s Gate for his first time. It was a good trip, and the couple from Australia really enjoyed themselves, and has memories which I’m sure will last a lifetime. It’s been a busy week, fun, but kind of hectic with the CJ having issues again, but it was nice seeing old friends, and meeting new people; after all, to me that’s what Jeeping and Moab is all about! P.S. Even with all this Jeeping, I don’t have a lot of pictures, sorry about that we just went out for fun and didn’t worry too much about taking photos. Here’s a great video Jonny did of our day on Steelbender. 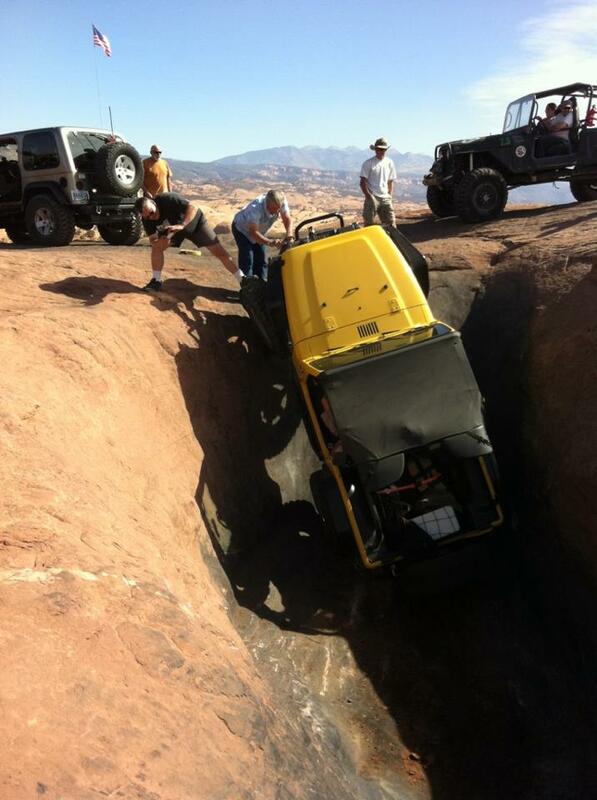 Reblogged this on The Jeep Experience.